Antitrust policy nominally plays an instrumental public interest role. The generally accepted notion is that it is a government instrument designed to intervene in relatively unregulated markets in order to preserve rivalry among independent buyers and sellers. Competition authorities are supposed to restrain business conduct that exercises monopoly power aimed at excluding competitors or exploiting consumers and clients. Thus it can be said – although few pro-market theorists make the insight explicit – that antitrust provisions reveal mistrust of the capacity of markets to promote social welfare. The inner logic, enforcement mechanisms, and practical outcomes of antitrust provisions are all intrinsically contradictory to the natural dynamic course of market functioning. In Dr. De Leon’s challenging thesis, this mistrust of the market lies at the root of antitrust policy, giving rise always to a preference towards ‘predicting’ the result of impersonal market forces rather than interpreting the entrepreneurial behaviour which creates those forces. And it is in Latin America that he finds the powerful evidence he needs to support his case. From the formative years of Latin American economic institutions, during the Spanish Empire, economic regulations – far from being driven by the pursuit of promoting free trade and economic freedom – have been conceived, enacted and implemented in the context of deeply anti-market public policies, trade mercantilism and government dirigisme. The so-called “neoliberal” revolution of the 1990s triggered by the Washington Consensus did not really change the interventionist innuendo of these policies, but merely restated the social welfare goal to be achieved: the pursuit of economic efficiency. Dr. De Leon presents his case against the assumption that consumer welfare orientated policies such as antitrust do really promote entrepreneurship and market goals. Paradoxically, antitrust enforcement has undermined the transparency of market institutions, in the name of promoting market competition. The growing significance of Latin America in the context of economic globalization endows this book with huge international interest. Written by a leading authority on the topic, this is the first book that presents a detailed description of Latin American antitrust law and policy as it has been developed through numerous judicial opinions. A wide variety of audiences around the world will find it of extraordinary value: competition law specialists, scholars and students of the subject, policymakers and politicians in Latin America, as well as all interested lawyers, jurists, and economists. Foreword. Introduction. I. The Wellsprings of Latin American Competition Policy. 1. The Cultural Background of Anti-market Institutions in Latin America. 2. Neoclassical Market Competition: A Look into the Anatomy of Economic Utopia. II. Latin American Antitrust Policy: Utopia in Practice. 3. Monopoly Power Assessment. 4. Consumer Welfare Analysis. 5. Horizontal Mergers. 6. Horizontal Restraints. 7. Vertical Restraints. 8. Unilateral Restraints. 9. Antitrust Policy in Regulated Industries. III. 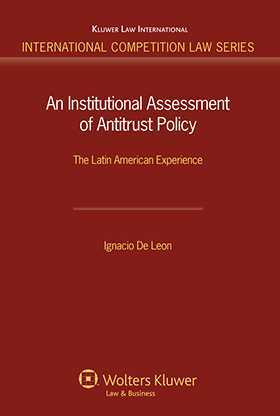 Institutional Assessment of Latin American Antitrust Policy. 10. Rule Stability versus Antitrust Enforcement. 11. Latin American Competition Agencies: Renewed Government Interventionism. 12. Latin American Competition Advocacy: The Neglected Agenda. 13. Latin American Antitrust Policy in a Country-to-Country Perspective. 14. Conclusions: Overcoming the Antitrust Utopia. 15. Bibliography. Index of Figures. Index of Tables. Index of Cases. List of Statutes.